Use captured video surveillance footage to monitor, reward and train behaviors. You’re watching from across the room as one of your sales employees works with a customer. You cringe as you count the seconds go by. Your employee hasn’t looked up to make eye contact with the customer in more than two minutes while the customer is anxiously shifting their weight from foot to foot. On the opposite side of the room you see another employee engaging with a customer, making mindful eye contact, smiling, and gesturing. The customer looks relaxed and entertained. 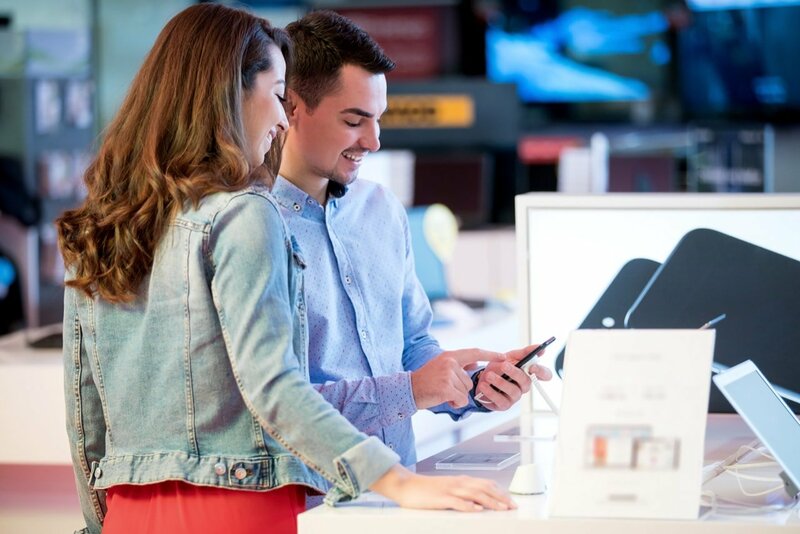 You can’t help but observe the subtleties of your employee behaviors when you’re inside one of your wireless retail locations, but when you aren’t watching, who is? Managed video solutions give wireless retail owners the opportunity to monitor and coach employee behaviors using integrated video surveillance, captured audio, and corresponding sales data. Imagine being able to easy capture and share the video and audio from the two customer experiences you observed earlier. Showing the first employee how he avoided eye contact and encouraging him to be more personable with customers. Use the footage of the ideal customer experience to reward that employee for her behavior and increase expectations among other employees and managers. 1. Quickly Identify Follow Up Training Opportunities: It’s hard to enact behavior change when you’re only coaching from data or not on-site to observe an incident first hand. Proactively coach your staff by saving clips of best practices and share with your team. 2. Follow Up After Behavioral Coaching: Monitor customer interactions after a behavioral coaching session to see if employees are remaining accountable. Follow up with an employee that you’ve trained to include more discovery questions in her sales process after reviewing her subsequent transactions. Reward her for doing a great job or decide how to move forward with additional coaching. 3. Empower Managers to Coach Behaviors: Boost profitability by empowering your managers to coach to behaviors–not numbers. Use clips of best-case customer interactions to inspire and reward employees. 4. Encourage Employees to Self-Assess: Allow and encourage employees to review the footage from their own sales transactions. This will allow employees to self-assess their behavior and find room for improvement. 5. Identify & Reward Best Practices: Managed video solutions aren’t simply for optimizing poor performance issues. Wireless retail owners can leverage captured video to identify and establish “best practices” throughout your whole team. Reward employees for particularly outstanding behavior when you review positive customer experiences. 6. Increase Leverage from Customer Feedback Surveys: Unsure how to process some of the feedback you’re receiving from recent customer experience surveys? Call up the corresponding surveillance footage, audio, and transactional data to get the full picture. Find out whether or not you can support your employee or your customer’s claim with the corresponding video, audio, and transactional data. Don’t give in to a customer’s complaint simply because you don’t know the whole story. In addition to using your captured surveillance footage to coach employee behaviors, you can also leverage this same content to streamline all of your human resources and legal claims. Review, download, and share the corresponding video footage to dispute or verify any claims. Envysion’s managed video solutions provide verified incidents straight to your inbox. Track incidents from creation through to close to ensure proper resolution of HR, legal and compliance issues and promote accountability throughout your organization.